In 1944 the ‘Butler Act’ introduced free secondary education for all. This was later than in most other industrialised countries. It was to be a national system, locally administered. With the Nazis and the USSR as models of central control it is unsurprising that British administrators did not favour a centralised system. Today, seventy years on, we have a highly centralised system. This is because England is at the vanguard of the ‘marketisation’ of education in Europe; it is a process that involves an intensified standardisation for teachers and students and a replacement of local, democratically accountable administration with chains of private educational providers overseen by a much more strongly centralised state education department. For example, throughout the 1940s, 50s and into the 60s the Ministry of Education would never have dreamed of interfering in the specific curriculum of individual schools. In fact, in 1960 the National Union of Teachers (NUT) said: “In this country the teacher has the inalienable right to decide what to teach and how to teach it”. This has changed completely. We can make sense of this drift away from education for social change and inclusion (Kenneth Baker’s “pursuit of egalitarianism”) by recognising it as one aspect of neo-liberalism. This “…aims to defeat the movements associated with state-focused, welfare oriented reform and to install a new systemic logic by which society (from government to the individual) responds to free market imperatives.” 1 In 1974 the IMF loan to the UK required an end to public sector expansion, an end to decentralised operational management and the introduction of detailed central regulation. So just as the idea of a common educational experience for all was beginning to take root the welfare rationale of ‘nation states’ began to disappear, ushering in ‘market states’ or ‘post-welfare states’. Margaret Thatcher came to power in 1979. In his history of English education, Derek Gillard writes “Thatcher’s neo-liberal policies affected not only industry and commerce but also public services. Conservative legislation sought to drive neo-liberal principles into the heart of public policy. An emphasis on cost reduction, privatisation and deregulation was accompanied by vigorous measures against the institutional bases of Conservatism’s opponents, and the promotion of new forms of public management. The outcome of these processes was a form of governance in which market principles were advanced at the same time as central authority was strengthened. Thus the twin aims of Margaret Thatcher’s education policies in the 1980s were to convert the nation’s schools system from a public service into a market, and to transfer power from local authorities to central government. The origins of this policy can be traced back to the establishment in 1955 of the Institute of Economic Affairs (IEA), a right-wing think-tank which, during the 1970s, had worked tirelessly to persuade the Conservative Party to abandon the post-war welfare consensus and embrace social and educational policies based on nineteenth-century free-market anti-statism.” 2 We will see that the IEA continues this ideological role today through the influence of one of its direct descendants, a think tank called Civitas. The curriculum, the teachers and the local education authorities all needed to be brought under much closer central control: by the mid-1980s the educational establishment had abolished the following independent advisory groups and committees: The Association of Local Authority Education Committees (‘83), the Advisory Committee on Supply and Education of Teachers (‘85) and the English and Welsh Central Advisory Councils for Education (‘86). Also in 1986 the Burnham Committee, established in 1919 as a negotiating forum for teachers’ pay and conditions was abolished. It was replaced by the unaccountable and unrepresentative ‘Pay Review Body’. 1986 also saw an Education Act that accelerated the process of disempowering Local Education Authorities. In July 1987 the government issued four ‘consultation’ documents on the National Curriculum, Finance, the Grant-Maintained (GM) system and School Admissions. The 20,000 responses to these documents were never shared and, in fact, were completely ignored! Having cleared the decks in this positively undemocratic way Kenneth Baker’s ‘Education Reform Act’ (1988) introduced a much more explicit pursuit of the ‘free market imperatives’ referred to in our definition of neoliberalism. It was strongly influenced by the Centre for Policy Studies (CPS), a right wing think tank dedicated to rolling back the state. David Pascal, of the National Curriculum Council, and Lord Griffiths, of the Schools Examination and Assessment Council, were both closely associated with the CPS. This ‘Reform Act’ led to the political control of teaching itself and a collapse of the 1944 cross-party consensus that teaching should not be subject to direct political interference. Very recently, schools minister Nick Gibb captured this significant shift by stating ‘Where I may be different from others in the past is that I do have a view about things like the curriculum, and about how reading should be taught, and how maths should be taught, and I see it as my role to initiate a debate. In the past these issues were often debated beneath the surface amongst educationists in a rarefied atmosphere that never saw the light of day . . .”3 It doesn’t seem to matter to him that he has no background in education at all other than attending school himself. Grant Maintained schools were introduced (‘88-’98) that were funded directly by central government, sidestepping local education authorities. They received more funding than regular state schools (£120 per pupil per year more) and they became overtly and covertly selective. In a move to be copied in the coming era of academies ‘failing schools’ were to be closed down and re-opened as GM schools. This despite no evidence that it would improve them; again something that will be a recurring theme as we look at the academies program. Those pushing for a removal of schools from local control, and a subsequent gifting of educational provision to the private sector and market forces, needed to present these changes to the public as improvements to those services. With no evidence that comprehensive schools had lowered standards and an “…absence of any popular demand for (radical change) from any section of the education community nationally or locally, nor even from the populist media”4 the best way to do this was to constantly reiterate the central message of a failing system; the media played a crucial role in attacking teachers and teaching strategies during this era, much as we see English newspapers routinely denigrating the NHS and the BBC today. In 1992 Ofsted (The Office for Standards in Education) replaced the old HMI (Her Majesty’s Inspectorate) that had been, in the by now familiar way, much more independent. Ofsted policed the schools with a more punitive approach than the old HMI. These new privatised Ofsted inspections were “…clearly intended as a law enforcement device (for the government’s) ‘recommendations’ on curriculum organisation and teaching approaches.” 5 In primary schools the job of finding failure was made much easier by the introduction of crude, unwieldy and compulsory Literacy and Numeracy hours. The Numeracy Strategy in particular eventually came in for considerable criticism. This led to a demoralised workforce, pushed around and ready for unprecedented re-moulding. It also led to a new language of ‘failing’ schools that helped to bolster a sense of a failing system, the language itself echoing the world of business and ‘failing’ companies ready for takeover or destruction. Something that confused the emerging grossly simplified picture of hard-working, well managed ‘successful’ schools and lazy, badly-managed ‘unsuccessful’ schools was the uncomfortable fact that a map of academic achievement (the traditional measure of success) looked almost identical to a map indicating economic prosperity. This aspect of the educational landscape has always required careful negotiation. To blame schools with poor results for their own outcomes can sometimes mean to ignore poverty, bi-lingualism and – typical of inner city schools – a high turnover of staff. This, tellingly, is exactly what Chris Woodhead (then head of Ofsted) did when he removed sections about these factors, beyond the direct control of schools, from an Ofsted report on the teaching of reading in 1996. Such an outlook, updated to today with talk of ‘zero tolerance’ and a new ‘boot camp’ approach in some schools, has helped to give the impression that any school with poor outcomes is ‘coasting’ and needs to be taken over, by private interests of course. In 1997 Tony Blair, as the new prime minister, continued this systematic destabilisation of public educational systems; the era of ‘academies’ was born and with it a more outspoken articulation of the market-driven ideal. Tony Blair, addressing the LEAs in 1998, told them bluntly “If you are unwilling to work to the modern agenda then the government will have to look for other partners.” In 1999 Cambridge Education Associates (CEA) became the first private company to take over the running of all the school services that had been provided by an education authority. Profits for their seven year £105 million contract were estimated to have been about £500,000 per year. 6 CEA was bought by Mott McDonald Group, an international multidisciplinary consultancy, the following year. In 2001 the DfE stated that 1988 (the year of Kenneth Baker’s Education Reform Act) had been ‘Year Zero’. Before then, it claimed, the economy had been stagnant, producing a school system in its own image. The education system’s choice of focusing on ‘social’ rather than ‘economic’ goals had contributed to this stasis, we were told. These sorts of critiques that blame schools and teachers for increasing poverty are typical of the neoliberal outlook. For a very clear recent example of this see the Gates Foundation sponsored film ‘Waiting for Superman’ (2010). This is a film that was made because there was no real evidence in America that charter schools (the US equivalent of academies) were improving the educational situation. In the absence of evidence that can be presented in open and critical dialogue we have propaganda instead. It is a film that attacks teachers and teaching unions. It also exercises a clever argument: it accuses those who recognise poverty’s impact on educational outcomes of ‘the soft bigotry of low expectations’. To make such an accusation is to deliberately blur the line between genuinely grappling with the complexities of context and simply believing that children from poor backgrounds cannot succeed. These are, needless to say, not the same thing and this is what makes it a clever piece of rhetoric. This erosion of democratic principles is exemplified, within educational provision, by the arrival of academies first announced by New Labour’s David Blunkett in 2000. Various different strategies were tried by successive governments to introduce these new institutions that were to be funded directly by the department for education but free of Local Authority control. At first academies were to replace failing schools, later they were to be a reward for successful schools. Sometimes LEAs were threatened with a withdrawal of funds if they did not want to ‘academise’ schools. Occasionally schools were not told that they were being turned into an academy (e.g. in one Bradford school it was the unions that alerted the headteacher). Sometimes vulnerable schools (i.e. those with high numbers of ethnic minority children and social deprivation) simply had the whole board of governors replaced (with no parent, teacher or local person represented). All of these approaches are indications of a top-down process of reform. They are another indication in the English school system of a drive to break up the public provision of education. This has never been something demanded by a majority of parents or teachers. Now, fifteen years on, 70% of secondary schools are academies. The government-initiated ‘PricewaterhouseCoopers Academies 5th Annual Report’ concludes that “there is insufficient evidence to make a definitive judgement about the Academies as a model for school improvement”. This has not made any difference to the government’s continuing drive to force all schools to become academies. In September 2014 Policy Exchange, another right-wing think tank, produced a report warning of “the risk of mass failure” unless all schools become academies by 2020. A year later the Sunday Times article ‘All schools to be academies by 2020’ refers to schools being “released from local council control” in a move to “save the taxpayer hundreds of millions”. Free Schools also entered the picture. These are a type of academy set up by parents themselves, but again overseen directly by the Department for Education. Bruce Liddington (previous CEO of E-ACT) was able to pay himself £300,000; the head of the Harris chain, that runs most secondary schools in South East London, paid himself even more. Barnfield College in Bedfordshire claimed £1 million for non-existent students (Barnfield Federation also runs four academies). The Guardian newspaper found academy chains paying millions to private firms associated with their directors. Some academy administrators don’t exist, e.g. Carillion Academies Trust. That is to say it is an organisation that prefers to keep its operations and finances as opaque as possible, to the point of being non-existent! Now that 70% of secondary schools are academies the next step is to set up primary schools to fail so that their transformation can be apparently justified. This is a straightforward process. In the 2016 Standard Assessment Tests (SATs), to be taken by all children in their final year aged 10/11, there is now a new “higher expected standard” which 85% of pupils will be expected to reach. Schools will also have to show that pupils “make expected progress”11. “The problem is that schools will not know what counts as sufficient progress until the tests have been taken. It is only then that the government will set out its definition. The Department for Education (DfE) thus has the power to influence from year-to-year the number of schools that will fall below its threshold.”12 This is, of course, academisation by any means necessary! Examining the lopsided spending also exposes these priorities: in 2013 non-academy infrastructure spending was cut by 81% and the non-academy schools budget was cut by 4.31% but the budget for academies was increased by 191%.13 Consider as well the fact that, according to DfE data released in July 2015, the average amount of funding given to free school pupils in 2013 – 2014 was £7,761 compared to £4,767 in ordinary state maintained schools. One type of school is set up to fail, another is given extra financial support to help it succeed. This continues a pattern of financially supporting those types of school that politicians are pushing for (see the GM schools funding mentioned above); a little enticement in the absence of any real need! It also plays well ‘on the ground’ as brand new academies appear, full of promise and aspiration, in poor areas. Education in England over the last two or three hundred years can be loosely thought of in three phases. Firstly the classical humanist tradition of academic, disciplinary knowledge intended for an elite. Then, from Rousseau onwards, a more child-centred, ‘progressive’ approach begins to emerge. It’s interesting that there are few English names in the history of pedagogical thought. Perhaps this is one reason why the radical re-shaping of the English education system has been so successful: without a strong sense of teacher identity grounded in home grown pedagogical models the system is vulnerable to ‘disruptive innovation’, a term coined by management executives in the mid-90s. The ‘progressive’ approach to education is an antidote to the harsh pedagogic regimes of old-fashioned schooling. It is a pedagogy that sees individual development and self-realisation as the motors of learning; it can even combine with ideas of collective emancipation. It is the interdisciplinary and collaborative approach found at the heart of the influential Plowden Report’s recommendations (a far-reaching study of English primary schools published in 1967). The widespread adoption of this report’s recommendations did much to galvanise a backlash – in two ‘Black Papers’ published in 1969 – against those same ‘egalitarian’ forces that Kenneth Baker would still be grumbling about twenty years later. Today we have moved into a third, modernised period of teaching marketable skills and competencies. To produce workers for the economy has become the primary mandate underpinned by an economistic conception of education: a subordination to market logic where competition and success are key terms. Crucially pedagogy becomes driven by the desire to identify the learning strategies that are most effective in reaching externally given and predefined outcomes. An education system emerges that has a ‘hyper-rationalised’ approach driven primarily by a narrowly economic view of effectiveness. This is critical because it helps make sense of the current climate for teachers in England, many of whom do not take any interest in this historical understanding despite their own massive personal investment in their work. The narrowly economic view mentioned here is the reason for the data-heavy approach to assessment in schools, it’s the reason teachers, and indeed parents, complain about the pupils being reduced to numbers. The data-driven approach thrives on test results. The more tests there are the more numbers there are to crunch! This, the thinking goes, can only be a good thing. Teachers talk about the individual student becoming lost in this system. The US, always about ten years ahead of England with these developments – in the same way that England is about ten years ahead of the rest of Europe – is now beginning to experience a significant backlash against the massive amount of testing that goes on in schools. George Bush’s ‘No Child Left Behind’ became nicknamed by teachers simply ‘No Child Left’. This reflects our understanding of the differences between the so-called ‘progressive’ approach and the modern technocratic, neoliberal approach. The reduction of education to an ongoing assault of tests and more tests is all part of the enhanced ‘accountability’ demanded of teachers. This is a pattern currently playing out internationally with transnational organisations like the World Bank, in documents going back two decades and more by now, insisting on bigger classes (for greater cost effectiveness), better managing of teacher’s salaries and quantifiable learning targets. For example, the bank’s recommendations to Namibia in a 2003 report recommended increasing average class size from 33 learners to 40 while, of course, reducing public expenditure and increasing the privatisation of the system. There is no mention of pedagogy of any sort here; the nearest we come to this is in the focus on increasing ‘accountability’. In England, since September 2015, teachers are subject to Performance Related Pay. Keith Joseph had tried to introduce something like this, twenty years earlier in 1985, but it had resulted in a year of industrial action. The great irony is that ‘Payment-by-Results’ was abandoned in England over one hundred years ago because it led to teaching to the test, a narrow curriculum and fiddling the data as it is again today! These shortcomings do not matter, though, because this is a system overseen by a new set of values: “the preoccupation with quantitative indicators and quantitative targets in ‘contract culture’ leads to perverse results’”; this “target fetishism” is “…a concern with targets which threatens to become detached from the social purposes of the policies at stake”.16 Also, of course, the tests themselves present lucrative opportunities for the production of test papers, set texts, software, etc. The exam boards in the UK made profits of £610 million in 2003-4. The more standardised and internationalised these tests are, the greater the returns can be. The education ‘market’ globally is considered to be worth $4.2 trillion, roughly equivalent to Japan’s GDP. The tests contribute, as we have seen, to a rigid system of performance management. This, in turn, helps reduce teachers to low cost technicians delivering a scripted curriculum and trained in prescribed practices. The low cost is important to the emerging edu-businesses around the globe. A school spends 80% of its budget on staff salaries in England. Academies are already allowed to ignore teachers’ National Pay and Conditions and there is a culture of ‘churn’ emerging where new young teachers are worked to ‘burn-out’ and replaced; alongside this there are agencies such as ‘Teach First’ and ‘Schools Direct’ that work with an approach that sees graduates dipping into teaching for a few years and then moving on. All of this disempowers teachers as a collective, professional body. It contributes to low morale, high turnover (one third of teachers leave within five years) and a breaking up of one of the last large scale unions in England. The tests and the publicising of results in League Tables (these have been growing in England since 1994) also lead to the creation of a ‘quasi-market’ of winners and losers; in theory this introduces ‘choice’, a buzzword for the free marketeers. In reality what is emerging is a ‘two tier’ system of education, something Margaret Thatcher made clear she wished for in pursuing the policy of GM schools back in the 80s. 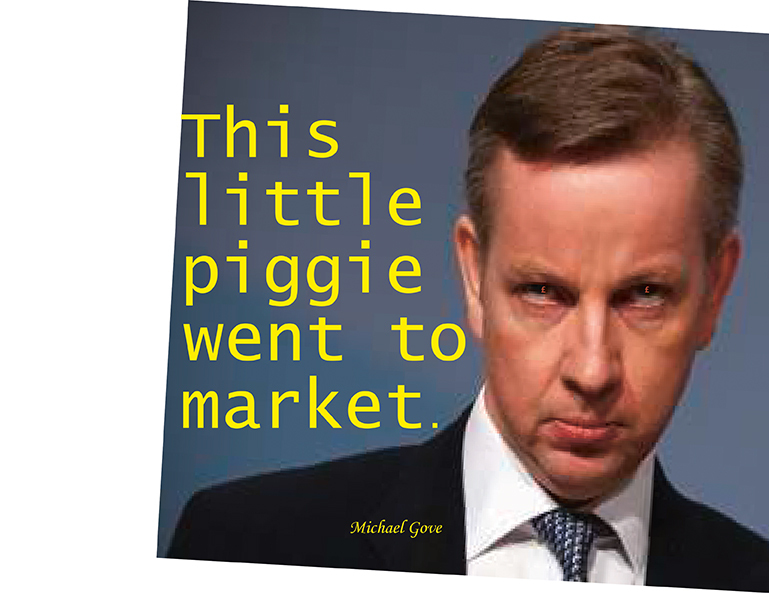 As Michael Gove, (education secretary 2010 – 2014) said, “Some schools will fail as the market takes over”. Such an occurrence in a marketplace is normal but it is destructive in a system of universal free education because it has an impact on individual children’s lives. These are some of the unhappy outcomes of a misguided approach to measuring effectiveness. The impact on pupils is catastrophic. Higher order thinking is jettisoned, problem-solving skills are devalued, aesthetic learning and the arts are sidelined (England has just introduced a new ‘English Baccalaureate’ that requires a minimum of seven GCSEs – exams at 16 years old – that includes no creative subjects). Working in a system dominated by an atmosphere of high stakes testing is quite normal now even at the primary level. It’s worth considering the following list because it draws attention to just how limited any test is. It’s a collection of characteristics that no school ever sets any tests in: love of learning, bravery, zest, enthusiasm and energy, leadership, appreciation of beauty and excellence (awe, wonder), humour and playfulness, creativity, ingenuity and originality, curiosity and interest in the world, critical thinking and open-mindedness, perspective (wisdom), persistence (perseverance), honesty, authenticity and genuineness, capacity to love and be loved, kindness and generosity, social intelligence, fairness, gratitude, hope, optimism and future-mindedness, sense of purpose, forgiveness and mercy, self-control and self-regulation, citizenship, teamwork and loyalty, modesty and humility, caution and prudence. The emphasis here on ‘testable’ information is typical of the obsession with quantifiable learning targets; never mind if the skills of proper consideration and interpretation are lost, can it be tested or not? In principle there is nothing wrong with a clear plan of what knowledge learners should acquire and monitoring the performance of those learners. The danger is when there is an exclusive focus on learner performance, narrow assessments, allocation of scarce resources to support elaborate assessment systems and viewing teachers as conduits who follow scripts to raise test scores. “…preparing teacher technicians at low cost who …will obediently carry out the master plans designed by policy makers to raise examination results on a narrow range of basic skills…should not be confused with high quality education.”18 With private corporations and entrepreneurs wanting education to be a cashcow and a source of ‘flexible’ labour this is what schools are reduced to. Private monopoly capital is now dominant over state capital. Our own era of the ‘market state’ represents an end to any compromise there may have been between the two. The Centre for Market Reform of Education (begun in 2013 and based at the offices of the Institute of Economic Affairs mentioned above) tellingly changed its name recently to The Centre for the Study of Market Reform of Education. That is to say the reform has now happened, it is the market (i.e. global business interests and not politicians or even teachers and certainly not students) that shapes our system of schools and universities. “We believe that the main problem in education is the lack of incentives to improve pupil performance” they say; there is a lot of this and little thought given to educational philosophy. We hear much about the dynamic, new global knowledge-based economy with its need for constant adaptability and a constant updating of skills and competencies. We hear little about the mass of low qualified, badly paid and unprotected workers that are an indispensable part of this economy. We hear even less about the insidious effects of a marketised system of education. This is because, in England at least, a few think tanks, most of the press and the financial sector have a massive influence on how we regard educational provision. Opinion pieces in the press help to quietly re-frame the debates. For example, a short piece by Matthew Parris in The Times20 dismisses teachers’ resistance to excessive testing as deeply self-interested and “…unconsciously calculated to featherbed a quiet life…” This was written just as the global financial system went into meltdown due to a culture within the financial sector driven entirely by self-interest! There is “no alternative” to testing, Parris writes, and it is “nonsense” that nobody is better qualified to assess a school class’s performance than its own teachers. The public, or ‘customers for public services’ to use the more ‘market’ term that he prefers, are ‘trapped by monopoly (state) provision’. Apart from this kind of writing by ill-informed journalists there is also the influence of various think tanks to take into consideration. Civitas, the Institute for the Study of Civil Society, founded by David Green in 2000, makes an interesting case study (in a familiar pattern he had been at the Institute of Economic Affairs himself from 1984 to 2000). Civitas take pride in tackling ‘falling standards’ and challenging the ‘state monopoly’. They do this on the ground running a number of ‘supplementary’ schools in England as well as publishing books that promote the agenda one would expect from an offshoot of the IEA: exaggerating the influence of ‘progressive’ approaches, in order to usher in a new era of ‘standardised’ knowledge, is a key part of its role. For example, Toby Young’s book ‘Prisoners of the Blob: Why Most Education Experts Are Wrong About Everything’, published by Civitas, complains that British state schools are in decline even though there is no evidence that this is the case. The term ‘blob’ was introduced by Michael Gove (education secretary 2010 – 2014) to describe most of the teaching profession; it was quite normal for him to describe those who raised concerns about his policies as ‘enemies of promise’ and the like. This sort of language gives you an idea of the level of (non-existent) debate in England. Toby Young accused left-of-centre education writer Fiona Millar of being “the blobbiest member of the Blob in the history of blobbery”. This is the language of people who know that there isn’t even a debate anymore. In his ‘Prisoners…’ book he tells us “The central pillar of The Blob’s educational philosophy is the belief that children are essentially good. That is, children are naturally curious, imaginative and creative and the purpose of a good education is to enable children to express fully these innate talents”. Just to be clear: he is holding this point of view up to ridicule. Although he writes books on the subject and he co-founded the West London Free School, he has no background in education or teaching. His fellow ‘attack dogs’ Daisy Christodoulou (Seven Myths About Education published by Civitas) and Robert Peal (Progressively Worse: The Burden of Bad Ideas in British Schools published by Civitas) write in a similar way pushing the ‘neo-traditionalist’ outlook (a strong focus on knowledge transmission). This emphasis on a ‘knowledge-rich’ curriculum fits the high stakes testing, data-driven system that has been outlined above. It goes without saying that Civitas publish a ‘What Your Year 1/2/3/4/5/6 Child Needs to Know’ series of books. These are inspired by the American E.D. Hirsch and his ‘Core Knowledge’: a detailed outline of the content and skills which his Core Knowledge Foundation (established in 1986) recommends should be taught in each grade level, from pre-school to Grade 8. Ironically in today’s highly connected world where information is so easily and rapidly available it is arguable that, now more than ever, teaching the open-minded ability to discern useful information and to think about it critically is more useful than memorising text books that set out what is going to appear in the end of year exam. A brief summary of English education drawing attention to the impact of marketisation was described by Andrew Old, the editor of www.labourteachers.org.uk, as a ‘capitalist conspiracy theory’.21 Yet the story of what is happening to English education is observable around the world. Not least in the US where there is increasing unrest amongst parents and teachers at the excesses of the approach. This very brief exploration of the current state of education in England has looked back over the last seventy years, in particular the last twenty-five years or so. It has attempted to make sense of the changes in terms of a neoliberal ideology that aims to subjugate the public interest to corporate interest. This subjugation has already happened in many countries around the world; in the last 30 years this process has escalated and we are witnessing an expansion of it to the developed world. So-called ‘austerity’ in countries such as England can be likened to the structural adjustment programmes demanded of poorer countries by the International Monetary Fund. The point is that the enforced ‘liberalisation’ of these economies (including conditions such as the removal of capital controls, restricted levels of public spending, prioritizing debt repayment and corporate welfare over human welfare, suppressing wages, restricting labour unions and selling off public industries and services) would have been highly unlikely in a properly democratic context. It is just one example of the last of these conditions, the selling off of public services, that has been explored in this essay. An update to this article published in datacide sixteen is HERE. 21.https://jennycollinsteacher.wordpress.com/2014/11/12/perception-vs-reality/ In Andrew Old’s comments beneath this article he sees no evidence of privatisation in the English education system.